Want live jazz with your eggs Benedict? A Thai take on the ever-popular hybrid of breakfast and lunch? We went all over Seattle and to Redmond to try out the area’s newest brunches. You’ve seen — or been a part of — the lines, paper coffee cups clutched in hands. The Seattle area LOVES brunch. If your favorite’s been overrun, or if you just want to try a new one, we’ve got a half-dozen options for you. 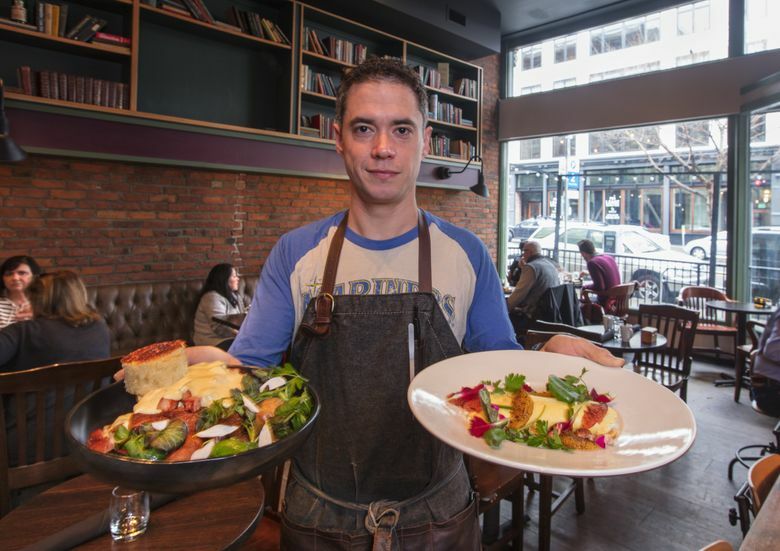 1007 First Ave., Seattle, 206-624-3646; bookstorebar.com; weekend brunch 8 a.m.-3 p.m.
After several years at Chicago’s massively acclaimed Alinea as culinary director, Eric Rivera took over as executive chef of the Alexis Hotel’s Bookstore Bar this past fall. Brunch is not, generally speaking, rocket science, but Rivera can’t help but take it there in a quest for brunch excellence. For the toad-in-a-hole-style Benedict ($17), the hollandaise involves a Thermomix at 70 degrees for ideal egg-yolk consistency; Champagne vinegar contributes more of the acid than lemon, keeping it light and bright. The house-made Canadian bacon: cooked sous vide for 48 hours, smoked for six more, cured for three days. Neither the menu nor the server belabor any of this, and on the plate, things just seem better than usual. An omelet ($16) here isn’t just perfectly cooked — with creamy goat feta inside, it’s garnished with charred citrus for tart interest, hazelnuts for crunch and an herb salad for fresh variety from bite to bite. 1400 14th Ave., Seattle; 206 556-4853; soicapitolhill.com; weekend brunch 11 a.m.-3 p.m.
Soi wakes up with the late-risers on Capitol Hill. 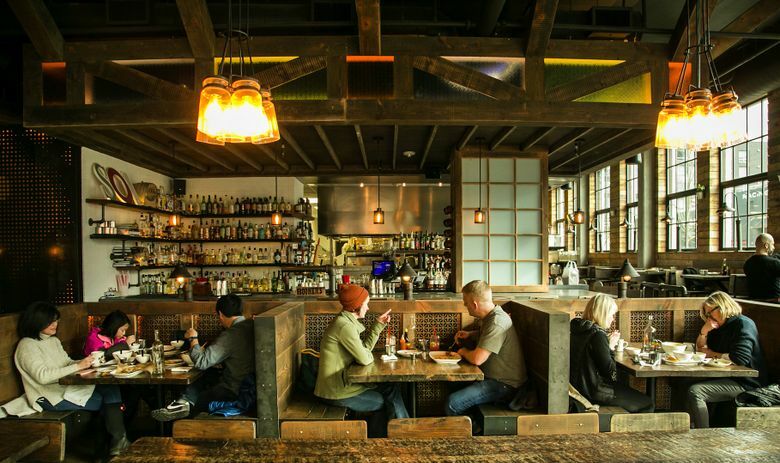 Doors open at 11 a.m. and there’s no wait in this spacious warehouse-y restaurant. 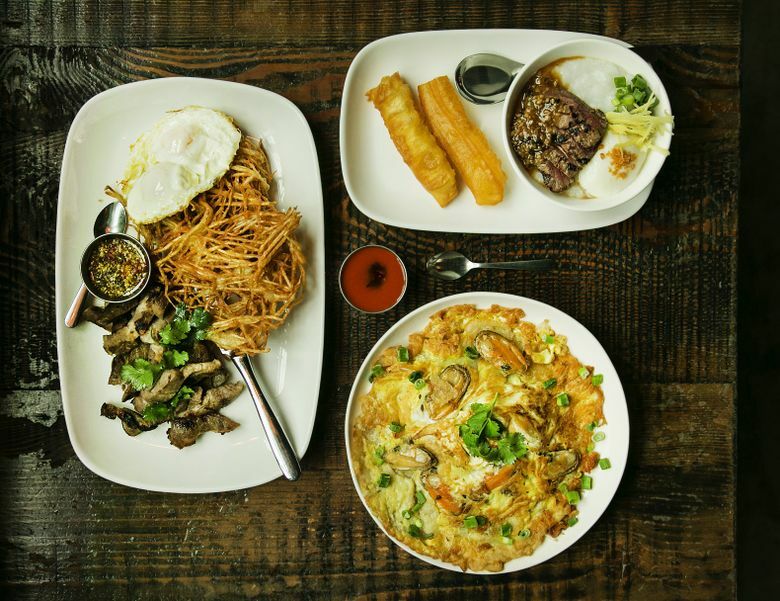 It’s American brunch with a nod to Thai cart food. Egg dishes come in truck-stop portions, served with grilled steak ($19) or pork collar ($17) marinated in soy sauce and Asian spices with a side of fried papaya instead of hashbrowns. For the hung over, rice congee cures all. The yolk oozes and thickens the porridge. The dish can — and should be — beefed up with grilled strips of New York steak ($12.50), a hearty meal but still with the DNA of a comforting soup. It’s served with an airy, crunchy Chinese cruller so addicting you will want to shell out the extra two bucks for another. 900 Madison St., Seattle; 206-622-6400; hotelsorrento.com; Jazz Brunch Sundays 10 a.m.-2 p.m.
Jazz is not at the height of its popularity, nor has the restaurant at the Sorrento Hotel gotten many recent raves, but apparently the magic mix of breakfast and lunch gilds all it touches, for Sunday Jazz Brunch there is a smash hit. The lovely, mahogany-paneled Fireside Room gets packed, reservations are definitely recommended. No one really listens to the live band — note to the management: rehashing last night’s goings-on feels less rude over instrumental music than vocals — but everyone seems very happy to be there. Bottomless mimosas ($15, fresh-squeezed juice) might have had something to do with it. The bloody mary ($12) involves, awkwardly adjacent to the musicians, a self-serve garnish bar: celery, bacon, pickled asparagus, shrimp, lots more. The menu offers the contemporary (e.g., a quinoa bowl) and standards like a good, unexperimental Benedict ($14) that only wanted a bit more lemon in the hollandaise. The Jazz Brunch Tower, though, is how most go: choices of charcuterie, cheese, toasts and more, stacked up on a silver stand ($9 per shareable-for-two plate, three for $24). Avocado toasts, topped with fried eggs, had a nice snap from pickled red onion; harissa deviled eggs, not overspiced, gave Jazz Brunch a happy picnic aspect. — B.J.C. 1529 14th Ave., Seattle; 206-257-4515; omegaouzeri.com; weekend brunch 10 a.m.-2:30 p.m. This two-story Greek restaurant is tucked away from the hectic Pike/Pine corridor, perfect for those hangover mornings. Its color schemes are of the deep sea, dry earth and washed denim, meant to transport you to a whitewashed village in Santorini. To start, get some Greek doughnuts ($9) to mop up the honey, like a jolt of espresso. You can’t go wrong either with the eggy-custard Bougatsa ($7), dusted with powdered sugar and cinnamon. On the savory side, eggs get baked with pieces of braised lamb that fall apart in chunky strands, the dish fortified with beans, tomato sauce and slabs of grilled bread on the side ($16). For something of the sea, there’s the pan-fried fillet ($19), the sea bass skin seared to a salty crisp with dabs of Greek red peppers, herbs and olive oil, its flavors and colors as bright as a Mediterranean morning. — T.V. 16175 Cleveland St., #109, Redmond; 425-285-9458; woodblockredmond.com; weekend brunch 10 a.m.-3 p.m.
Woodblock doesn’t judge — the brunch drinks list shouts “FOR THOSE WHO MADE QUESTIONABLE DECISIONS LAST NIGHT,” offering the opportunity to make more, including some involving tequila. Less dangerous, the bloody mary ($9) features rich house-made mix, local Oola vodka and a nice spiciness, with visible fresh-grated horseradish; a mimosa ($11) unexpectedly glowed crimson, made with blood orange juice. Nonliquid brunch brings updated all-American favorites in ample portions: braised brisket hash, banana-bread French toast. Woodblock Benedict ($14) deploys house-smoked pork belly instead of ham, but there’s not much salt or smoke there — maybe opt for the sockeye salmon cakes version. The latter half of the chicken-and-biscuits ($17), oddly but not egregiously, tasted sweet. Both the hollandaise and the gravy set up quickly, getting a skin on the surface, possibly a symptom of being made in big batches. On a recent Saturday, an inoffensive mix of ’80s hits played; the ground-floor-of-new-building space felt generically pleasant. But Redmond is clearly happy to have brunch at Woodblock — some looking hale, some like they made questionable decisions last night. When the weather warms, the outdoor seating facing an incipient park should be sweet. — B.J.C. 106 Occidental Ave. S., Seattle; 206-388-2196; nirmalseattle.com; brunch Saturdays 10 a.m.-2 p.m. Your brunchmate may feel betrayed there’s no eggs Benedict at this sleek Indian restaurant. But Nirmal’s rewards those who keep an open mind. Brunch comes in sharp clarion flavors — the spices aren’t staples, but familiar (tamarind and turmeric) all the same. Its rice cake ($9) is spongy with a crispy skin and topped with cubes of tomato, onions and peppers like a pizza. It’s eaten with coconut chutney and lentil stew. Grainy fried dosa ($8) comes folded like a crepe, stuffed with stir-fried chicken and spices that taste like fall. Paratha flat bread ($8) with paneer cheese looks deceptively mild-mannered, but it’s a flavor bomb of green chili, chat masala and turmeric — and spicy when eaten with the pickles. You need the fresh yogurt to douse the heat. Fine, order the mushroom-spinach omelet ($9) if you must. But we’re definitely gonna judge. — T.V.